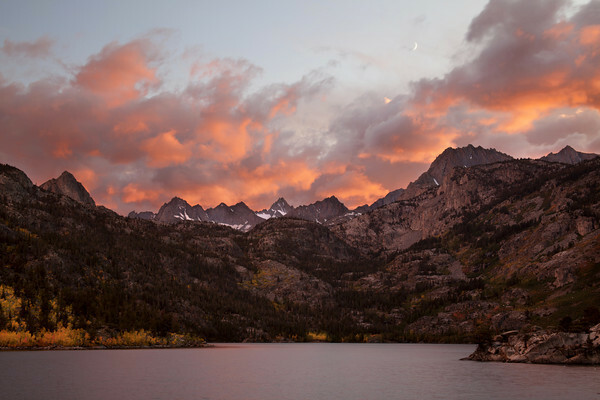 Lake Sabrina is a special lake in the Easter Sierra. Lake Sabrina pronounced (Sab R eye na) is located at an elevation of 9138 feet. You can drive right up to this Aspen lined lake with saw tooth glacier carved peaks. No hiking required. I'm not taking away from the hikers who navigate the John Muir Trail to see all of the many hidden lakes. You must hike many miles to get to these remote locations. Sabrina will give you some insight on the beauty that exists in the far reaches of the Sierra Nevada. The clouds do not always cooperate at sunset but on this evening nature put on a show in the clouds with a crescent moon rising above.